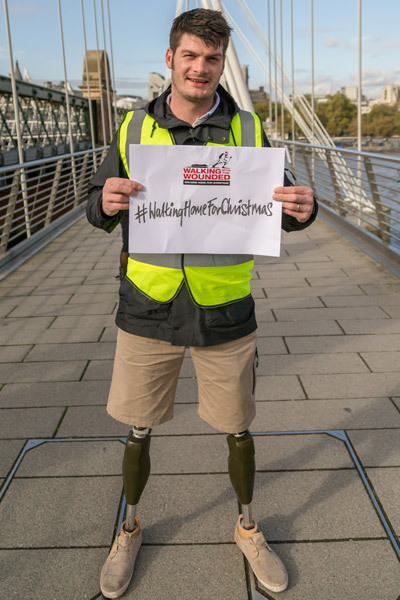 WALKING With The Wounded (WWTW), a charity which supports wounded veterans into work, has announced its new campaign Walking Home For Christmas. By ditching the bus, car or tube and walking home between 15 and 26 December, you can support our homeless veterans. Whether you walk one or one hundred miles, taking part is what matters. Entry into the event costs £15, which provides walkers with a branded bib and information pack. Those taking part can help the charity make as much as possible by seeking sponsors for their efforts. All money raised will go towards WWTWs Home Straight programme which focuses on supporting wounded, injured and sick veterans who have become homeless and getting them back into work. Invictus Games captain and gold medal winner Dave Henson, an ambassador for the campaign, said: “Walking With The Wounded [is] asking the UK to get their walking boots on and walk home this Christmas to raise much-needed funding and awareness for homeless veterans who have no home to walk to. Earn your turkey this festive season! Andrew Cook, Head of Fundraising at Walking With The Wounded, commented: “Our Servicemen and women have endured far worse conditions and environments than we can imagine. There are also esteemed titles to be had including furthest walk, biggest fundraiser, best fancy dress and biggest group/longest line of walkers. Why not ask your local patch to join you? Encourage your friends, family and work colleagues to take part – the more the merrier!